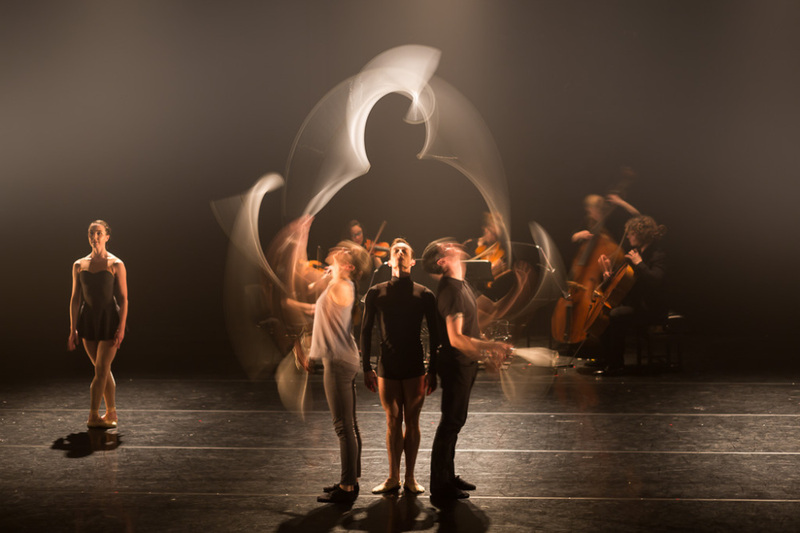 After the Camerata Alma Vira take their places at the back of the stage — a setting that suggests both classical concert and travelling band — the four dancers and four jugglers enter in a line. This is the opening proposal that sets the tone for the subsequent development. 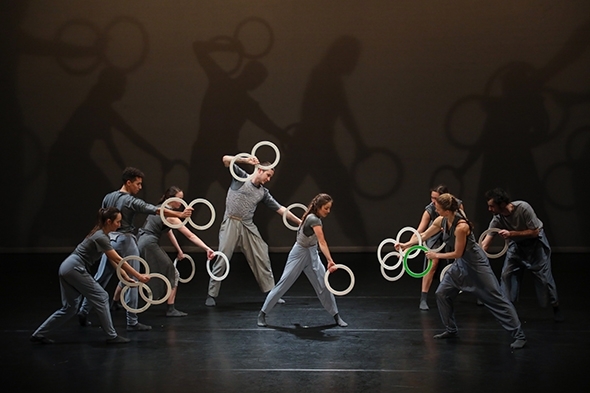 The jugglers begin juggling balls while the dancers’ arms circle above their heads and drop down to slap their thighs, together setting up spatial and aural rhythms enhanced by light. There are solos, the first by Kieran Stoneley that is expansive with lovely lines and then by Owen Reynolds who states the mathematical formula for a juggling act and then performs it. With the introduction of Borenstein’s music (hopefully it will be recorded by now) there is an additional mathematical layer: when the jugglers exchange clubs across a line of advancing dancers it is as if arms, legs and clubs are all dancing to the musical rhythms. Although the Gandini jugglers are brilliant technicians (I can’t take my eyes off them any more than they can take their eyes off the objects they are juggling), they are relaxed and in their relaxation they dance. There is something in their insouciant virtuosity that reminds me of the dancers in a Pina Bausch work. Every now and then they drop a ball or a club or a ring but it doesn’t seem to matter; they have a self-deprecating humour that is built into the art. There’s a scene where Owen Reynolds juggles three or four balls perfectly. Dancers Erin O’Toole and Kate Byrne are either side of him on pointe like malevolent fairies urging him to juggle more balls. He does and while he’s juggling they bourrée in place with a vengeance. When Reynolds succeeds, they clap enthusiastically but when he drops a ball they stop with a loud sigh of disappointment. The audience laughs. But is there a parallel scene where two jugglers stand round a dancer urging more and more pirouettes? No, and this signals the one flaw in 4×4: Ephemeral Architectures: the four jugglers are at the height of their art and constantly push its limits but Ondiviela and his four dancers seem constrained by their classical dance; they can’t simply let go of their training and enter into the movement with the same freedom as the jugglers accomplish their feats. When Reynolds stands alone on stage suggesting five possible ways to finish the show, the fourth (I can’t remember the first three) is to expound on the profound similarities between the two art forms. 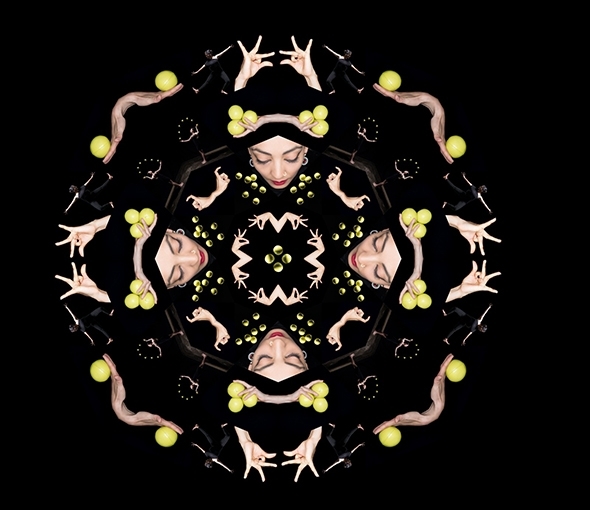 He means the two art forms of juggling and dance, but as we have seen, 4×4: Ephemeral Architectures comprises four art forms that each contributes to the creative vision of the work. Reynolds avoids the issue by choosing the fifth option which is a juggler standing alone on stage deciding how to finish the show.